T-Mobile CEO John Legere says a small fraction of his customers are "stealing data," and he is putting his foot down -- hard. In an open letter to T-Mobile customers with an unusually furious tone, Legere said that some customers are using special software to skirt past T-Mobile's data limits. He said if they continue to abuse the network, they'll be kicked off T-Mobile's unlimited data plans. Here's the issue: Along with unlimited smartphone data, T-Mobile (TMUS) allots 7 GB of extra "hotspot" data each month to customers of its Simple Choice unlimited plans. Customers can use that extra 7 GB to turn their phones into Wi-Fi hotspots, connecting their laptops or other gadgets to the Internet. But when they blow past 7 GB of data their speed will be throttled down until their next billing cycle. Legere said that some customers have been using software tricks to mask the fact that they're using their phones as hotspots. That makes T-Mobile think that they're using all that data on their phone's unlimited data plan. "These aren't naive amateurs; they are clever hackers who are willfully stealing for their own selfish gain," Legere said. "I'm not sure what they are doing with it -- stealing wireless access for their entire business, powering a small cloud service, providing broadband to a small city, mining for bitcoin -- but I really don't care!" He said some customers have used as much as 2,000 GB of hotspot data in a single month, "stealing data so blatantly and extremely that it is ridiculous." That has a negative impact on other customers, he said, since using all that data can slow speeds for everyone else. So T-Mobile developed a technology that can determine which customers are skirting the rules. If they don't heed T-Mobile's warning, they'll be barred from the company's unlimited plans. "We are going after every thief," said Legere. "No more abuse and no risk to the rest of our customers' experience. It's over. Count on it!" Legere is walking a fine line, because the FCC has been very clear on this topic. The commission fined AT&T $100 million for misleading mobile customers about its "unlimited" data plans, throttling data speeds after customers hit a certain data cap. Tracfone also got hit with a $40 million in January for falsely advertising its unlimited plan. A year ago, Verizon (VZ) abandoned plans to slow down 4G connection speeds for unlimited data plan customers after FCC Commissioner Tom Wheeler openly called the plan "disturbing." The FCC issued a similar notice to T-Mobile last year, which improved its notifications when it throttles unlimited plan customers. "Unlimited means unlimited," said FCC Enforcement Bureau Chief Travis LeBlanc when AT&T (T) was fined in June. "The Commission is committed to holding accountable those broadband providers who fail to be fully transparent about data limits." Legere, in a seemingly proactive defense against the FCC, opened his statement to T-Mobile customers by saying, "I want to make sure I am being really clear and transparent on this issue as we take action." He said the FCC's argument about data throttling is separate from T-Mobile's actions to stop customers from masking their hotspot usage. "These abusers will probably try to distract everyone by waving their arms about throttling data," Legere said. "Make no mistake about it -- this is not the same issue. Don't be duped by their sideshow." Legere said the number of customers who are taking part in data masking is about a hundredth of a percent of the company's 59 million customers. That's fewer than 6,000 customers in total, and Legere said the company is going to serve warnings Monday to "the 3,000 users who know exactly what they are doing." In an FAQ, the company said it is "absolutely not" doing this to extract extra money out of its heaviest users. "In fact, customers who are moved to a new plan will be paying less than they paid for on their old plan." 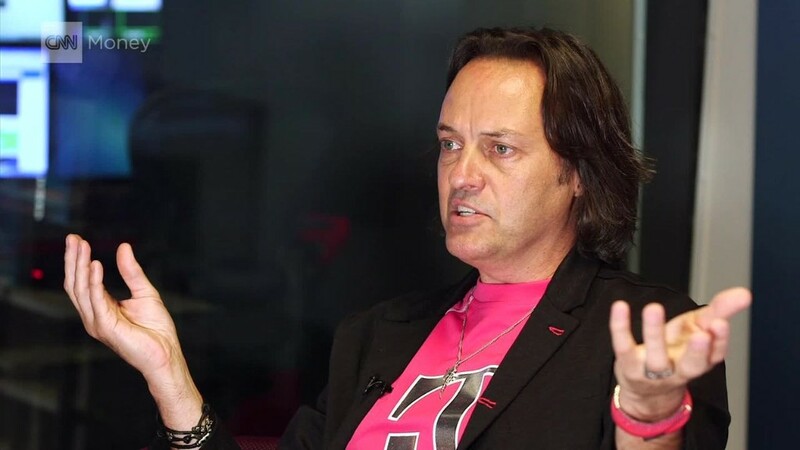 "If their activities are left unchecked their actions could eventually have a negative effect on the experience of honest T-Mobile customers," Legere said. "Not on my watch."